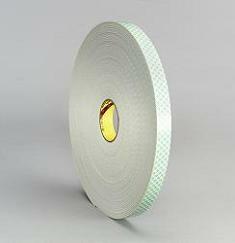 Tape → Double-Sided Foam Tape 1/8"
Excellent for mounting photographs, paintings, and signs to various surfaces. The foam evens out irregularities to present a smooth adhesive permanent bond. Interior use only. Tape is 1/8" thick. 1/2 inch x 36 yd. 3/4 inch x 36 yd. 1 inch x 36 yd.